Constantia wasn’t too sure about the latest craze. 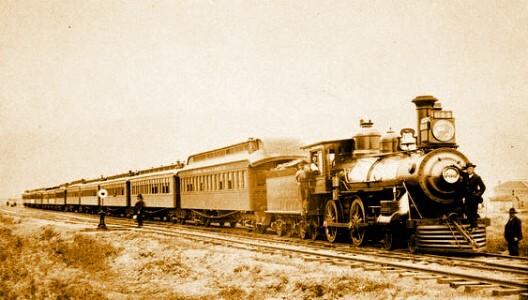 Trains had fairly recently come into frequent use. People could travel from one village to the next on a train. It was definitely going to be the cause of a new wave of immorality to sweep the country. Young men could take the train to a neighbouring village and no one would know them. They could get up to all sorts of hanky-panky if not chaperoned. The women of every village in England were no longer safe. Then there was the threat of people travelling from another country. One does not like to imagine the havoc red-blooded Frenchmen would cause among devout English maidens. To say nothing of the Germans. And the Spanish. The Spanish! Oh my goodness! As for those train carriages for long journeys that had sleeping facilities. Such heinous thoughts entered Constantia’s head as to what could possibly go on, that she could only shut her eyes tight and think of England. This so called “Industrial Revolution” consuming the country was striking the death knell for an upright and godly society. The sooner trains for travel were banned the better.